Ever been on the road, on your outdoor adventure, far from home when what do you see? ..... a road side traditional market place jammed with intricate animal carvings in stone, wood, or the beautiful green malachite. There are masks, drums, marimbas, spoons, book ends, walking sticks, jewelry and much more. A paradise of antiques and souvenirs, right? The pulse quickens in anticipation. The wallet tingles in fright! Back on the road again, and viola! The Mukuni Village is in sight. This is an authentic tribal village where thousands of people live and work. The closer you get the more you feel transported to ancient Africa. The buildings are African huts in a village surrounded by a wooden fence. A real outdoor adventure of traditional basketry, wooden carvings, and traditional dancers. 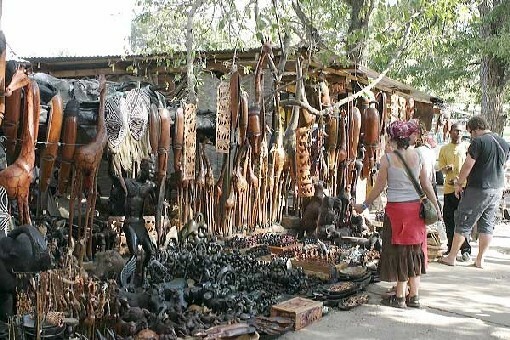 And many, many more cultural African handicrafts! You walk around the village touch the wares, admire the artistry. A decision is made! Must buy Zambian and capture this rare moment of your life. It is a rare visit, one and only one of its kind. The “love-Zambia-safari-bug” has got you. You are infected with memories of the friendly people and the warmest of warm African welcomes! As you continue along the road thinking you have seen it all, and what do you know? Suddenly you are almost on top of another wonder, the Songwe Point! Allen Harkness of Livingstone Tourism Association describes it thus; "This typifies a Zambian village with local traditions and hospitality. The Songwe Point is a must visit. It has captured the market of the international tourists including the upper class traveler of the world. The concept of the village is adventurous, unique and colorful because of the phenomenal culture of the local people’s hospitality." Both Mukuni Village and Songwe Point are in Livingstone town, Zambia's tourist capital. Livingstone also hosts the Adventure Centre and of course the mighty Victoria Falls . At the Adventure Centre you can choose your type of adventure holiday – exciting or mundane, high adrenaline action or sedetary leisurely enjoyment. The cultural villages, like the many theme-focused lodge and hotel accommodations are on the banks of the mighty Zambezi River. The picture they paint, the mood, the exquisite thrill is wholly unexpected. You will never believe this until you see it!! Take a visit to the cultural villages and the outdoor adventure market. Stuff your bags with the African antiques and souvenirs. This outdoor adventure, like African culture and African art , is a visit you will never forget.